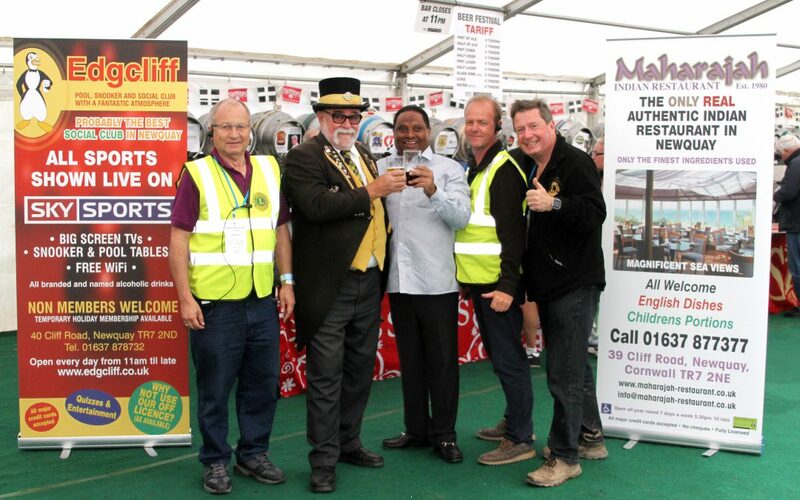 Newquay Towan Blystra Lions Club, who are organising this year’s sixth Newquay Beer Festival at Hendra Holiday Park are reminding potential sponsors that the deadline for signing up to support the charity event is 10 June. Whilst the event is not scheduled to take place until 21-23 September, in order to get maximum exposure for sponsors and advertisers, leaflets and programmes will be printed and circulated around Cornwall from mid July. Lion Phil Bunt, one of the organisers said: “We have many supporters who help us by sponsoring some aspect of the festival every year and opportunities start from just £30 for an advert, £100 to sponsor a beer or a cider and £195 to become a silver corporate supporter. There are perks for getting involved too such as complimentary three day entry tickets to the festival for sponsors and their guests and even ‘thank you’ beers or ciders on arrival with some sponsor packages. If you would like more information about how to get involved, visit www.newquaybeerfestival.com or give Lion Phil a call on 07971 031575. Download the sponsorship form, with details of opportunities available here.